Launch the EDB to MBOX Converter Tool on any version of Windows Operating System. It is compatible with Windows 10, 8, 7, Vista, XP etc. Microsoft exchange server store entire incoming and outgoing emails, attachments in edb and stm file respectively. 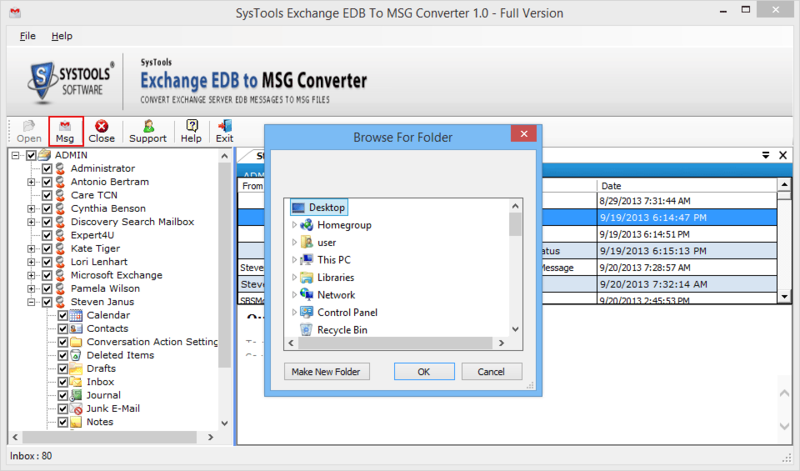 User can convert complete exchange data in msg format by using this edb to mas converter software. 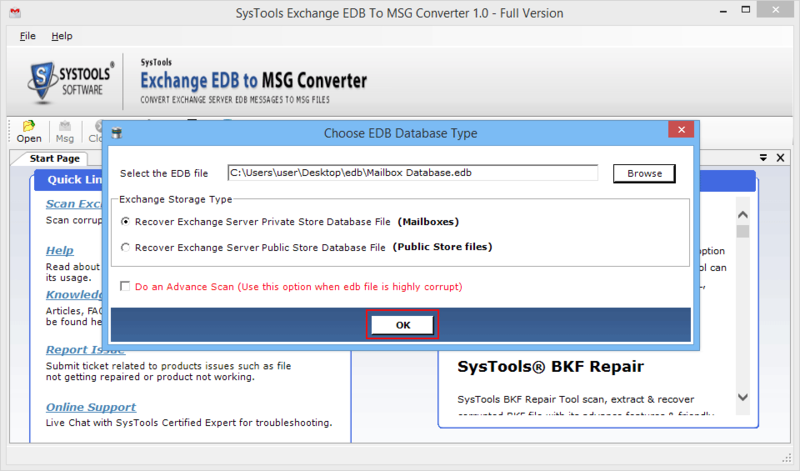 If exchange edb file corrupted or inaccessible and user want to convert it into msg format. Then this software is very helpful for you, simply download edb to msg converter. It will first repair corrupted files and then convert into msg format. 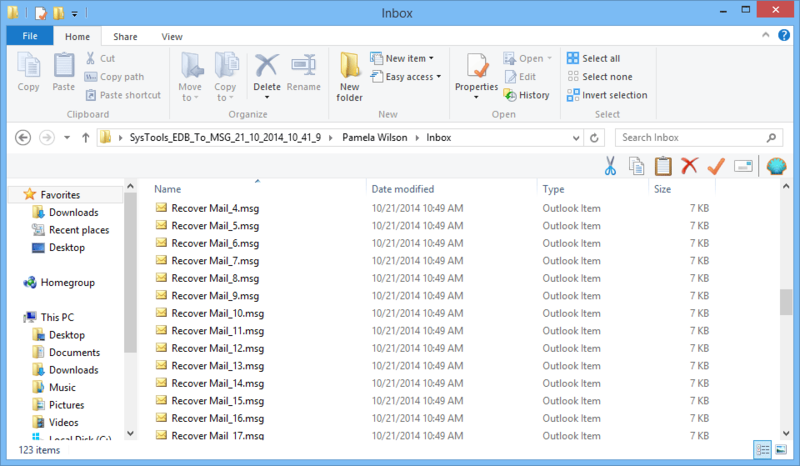 Software enable user to select database type to perform deleted mailbox recovery. You need to select either Recover Exchange Server Private Storage Database File (Mailbox) or Recover Server Public Store Database File (Public Store File). 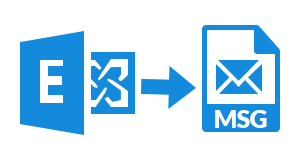 Exchange to msg converter software provides two scanning mode i.e. Quick Scan and Advance Scan. For minimal corruption use quick scan and for highly corrupted and deleted mailboxes use advance scan mode. After scanning exchange database edb to msg export tool provides preview of all scanned files and folders in the preview pane. User can view entire file before exporting it into msg format. This helps user to perform selective conversion. 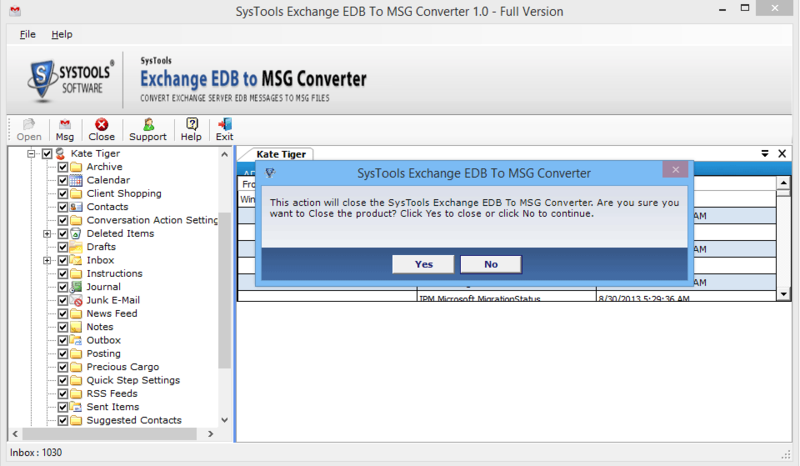 Export selective item feature of edb to msg converter tool is very useful. Because it enables user to select required files from the scanned edb file and then perform conversion. It ensures that only selected file will be converted into msg format. 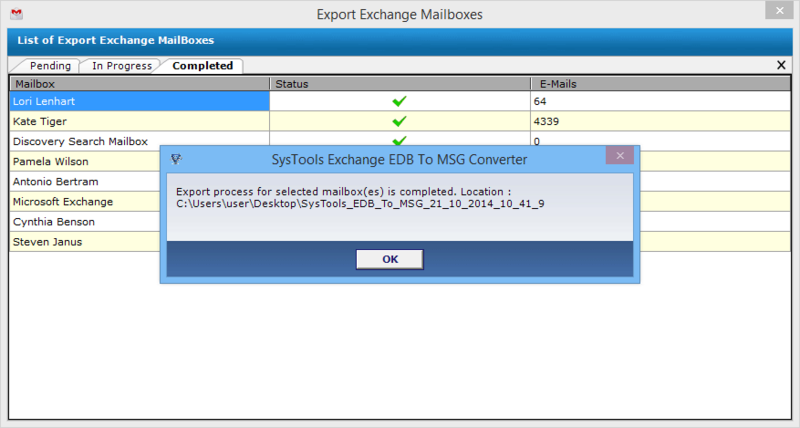 Folder structure will same in the resultant msg file as in the exchange edb file. The source file folder structure remains intent in the converted file. The software converts entire data and place the resultant data in same order. 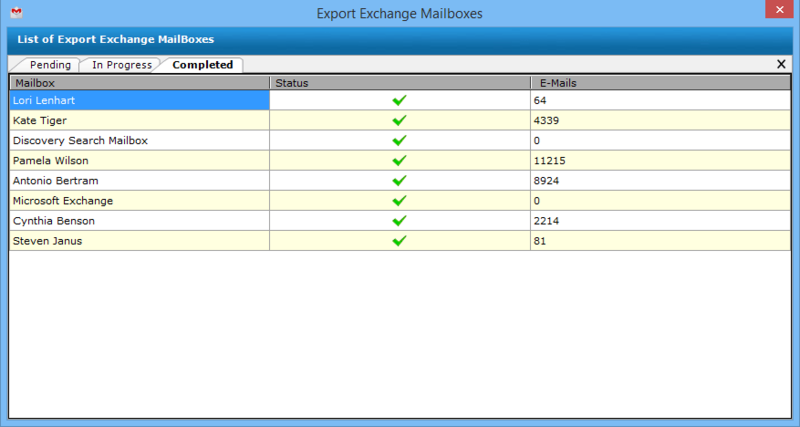 After exporting exchange server emails into msg file format software generates complete conversion process report. That includes no of file converted from each folder, pending files and in-progress files with links in csv format. Does the software compatible with windows 10 OS? Yes, The exchange to msg converter tool is compatible with all windows operating system. Can I convert attachments along with private edb? Yes, Software supports conversion of public (pub.edb), private (priv.edb) and attachments (.stm file) into msg format. Is the exchange environment necessary while performing conversion? 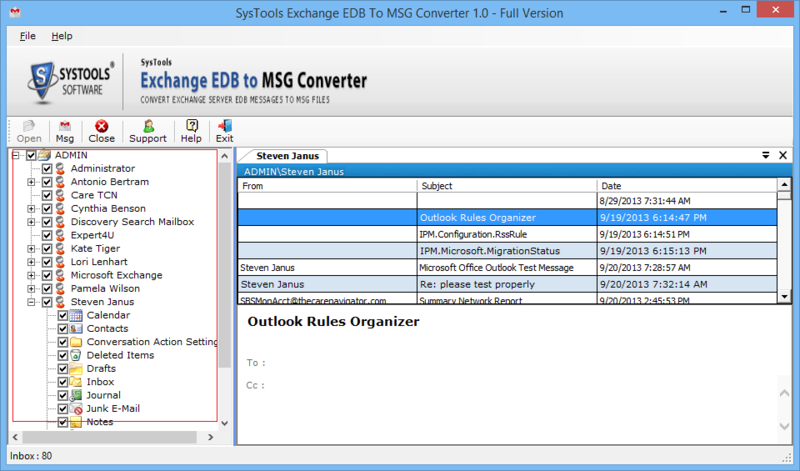 No, You can convert exchange edb file into msg format without installing MS Exchange Server. The software requires only .edb file for conversion. Can I recover deleted exchange mailboxes using this software? Yes, The software is capable to recover deleted folders. But for this you need to scan the edb file in advance scan mode. And this software does not recover deleted files. Can I view exchange edb file emails before conversion? Yes, Software provides preview of entire scanned items in preview pane. User can also select required files only and then perform conversion. Download the full version of the software and install on the host machine. The fist window of the tool will be appear like this, click on the Open button. A new pop up will appear as shown below. Click on Brows button to and locate the .edb file. Here you need to select exchange storage type either Mailboxes or Public Store File. Now the software will show you successful message, click on Ok. Here software will list all folder in left side. Simply click on the mailbox folder and all item in that folder will be displayed in right panel. Hit on the msg button from software menu and provide location to save the resultant msg file. Now the software will show you conversion process details like Pending, In Progress, and Completed files. After Successful conversion a message will appear to confirm and completes the process. Simply click on OK to end the task. If you found any mistake or not want to continue the process and hit on the tool close button and confirm it by pressing Yes. After it you will exit from the software window. Now navigate to the location where you saved the resultant mdg file and access the entire data. "Working on Microsoft exchange server and converting their file formats is not an easy task. Although I don’t have more experience of using exchange server. 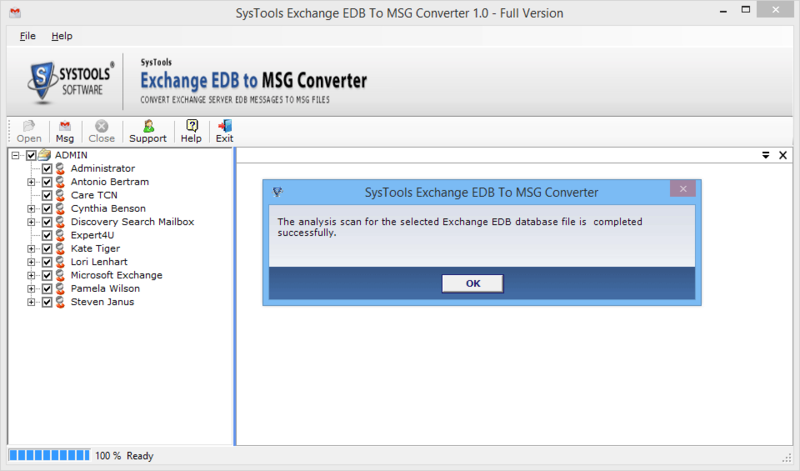 I converted entire exchange database edb file into msg format easily. Thanks to the software development team." "One day I need to repair corrupted edb file, which I stored on my external hard drive. 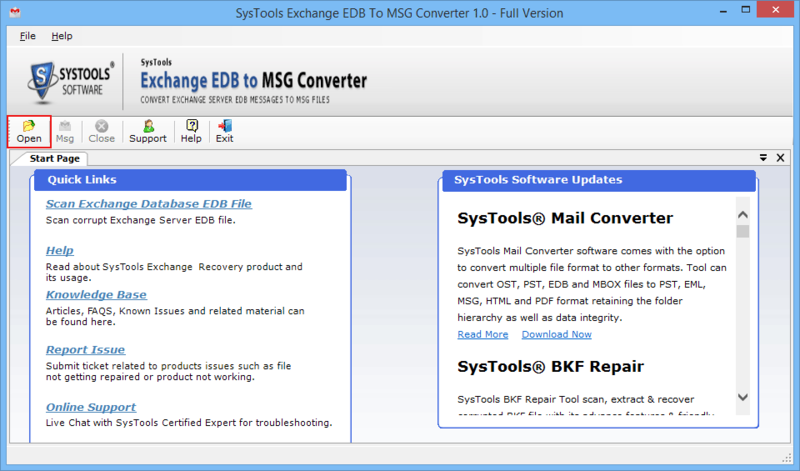 I used this edb to msg converter tool and repaired complete file and also converted into msg format. The software is quite simple to use. I would like to thank support team for all help."